If you are into skiing and have had a baby, you will probably be eagerly awaiting the day until you can take your child skiing with you. You may have started when they were just babies, with sleighs and other contraptions but now that they can walk, you want more of course. That’s where the Lucky Bums kids beginner snow skis and poles come in. They can be used from toddlers who have just started to walk up to around four years of age. They are great little kids skis that allow them to get used to the idea of skiing, all the while keeping them safe and secure. They are available from Amazon at very low prices, so this may be an ideal Christmas present for your little one. They are made out of plastic and are 70 centimeters long, making them ideal for a fun skiing experience. They have a rugged design with bindings that are flexible. Hence, the heel can be lifted and snow boots can fit. The straps on the kids skis make sure that the fit is secure and comfortable. The skis are fitted with scales at the bottom, meaning they have traction in the snow. There are no metal edges on the skis, making them very safe. These skis are designed to introduce little children to snow and skiing, making sure they are strapped in comfortable and securely. There are also a range of extras available to help you teach your child how to ski. These kids skis really allow children to become used to the sensation of sliding that is so typical to skiing. The benefits of these skis are tremendous, starting with their ease of use. Even when the child falls, the skis generally stay on. What is unusual about these skis is that they come with poles, a detail often overlooked in kids skis. The poles actually give them more balance as well as a more authentic skiing experience. The cons are that they are not really made to enable children to ski down slopes, but rather are designed to encourage a child to become used to skis and skiing. There are also some reports stating that the Lucky Bums kids beginner snow skis and poles do not fit every child’s shoe size, so you may want to make sure that your child’s foot will fit, particularly if they have bigger feet. Lastly, the skis are quite hard for children to carry so you may have to help out. 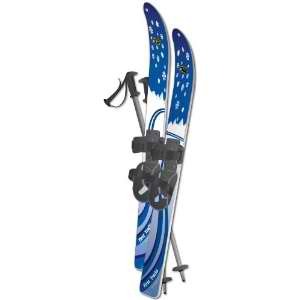 The Lucky Bums kids beginner snow skis and poles are fantastic skis for kids to learn to get to know snow and skiing. And at the price at which they are available on Amazon (just over $30), you could buy them as a stocking filler – a big one! This entry was posted in Other, Reviews, Skiing, Skis and tagged Kids, Lucky Bums, Skis. Bookmark the permalink.